If you swing by our new Chicago store (and you should—doors just opened at 932 Rush Street on April 3rd) you’ll notice a captivating multipanel wood installation. The impressive piece is the work of Michelle Peterson-Albandoz, a Chicago-based mixed-media artist and painter we commissioned to build a sculptural screen for our first-ever Windy City store. We’re excited for you to see it, and all of our spring goods. We caught up with the artist to talk about the piece and get her recommendations for must-see art shows in the area. How long have you lived in Chicago and why did you choose the Windy City? I moved to Chicago from Puerto Rico in 1989. I chose the city to further my education at the Art Institute of Chicago. I graduated with a BFA in sculpture and painting. 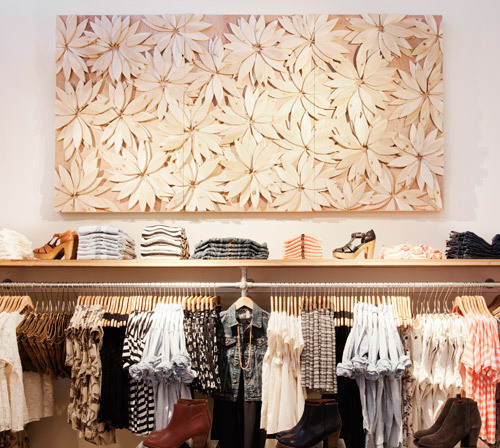 Can you tell us about the installation you built for the new Chicago Madewell store? It celebrates nature. My hope is that the viewer will celebrate nature and its gifts and become more sensitive to them. What environmental issues are of greatest concern to you right now? The sustainability of our forests and protection of our oceans. How do you communicate this in your work? By choosing reclaimed materials I relay the concept of sustainability and reveal nature’s beauty. I hope that the grounding visual of the work will inspire people to think about nature’s essential value in their lives. What are your favorite places to look at art in Chicago? Any must-see current shows? My favorite spot is the Modern wing of the Art Institute of Chicago. The Chicago History Museum has a great show up of Vivian Maier’s photographs. She wasn’t discovered until after her death and her story is worth knowing. This entry was posted in Uncategorized and tagged artist spotlight, chicago, madewell. Bookmark the permalink.